Ben! You are growing at warp speed right now my boy. Not only are you growing physically, but you understand SO much already! You are like, way smart kid. Unreal. I'm half expecting you to bust out the algebra one of these days. 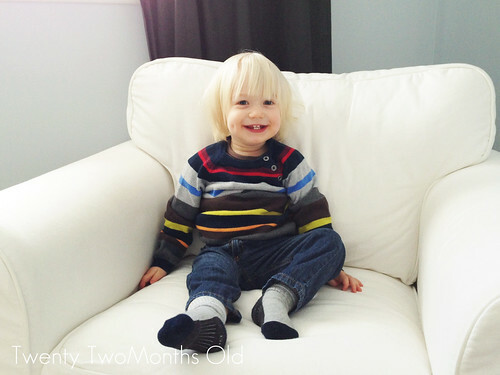 In two short months you will officially enter your terrible two's (though in my opinion you decided to take that role a little early, but whatev) and I'm so excited for you! The past few months you have felt like a different person to me. Like an actual person! Every day you seem more and more grown up. STOP IT. Ok, don't stop, but slow dowwwwn. We have much to do in these next few months little one. Your wee brain needs a LOT of stimulation and I'm hoping I can give it everything it needs. We're going to do all kinds of fun things, and soon we'll get to be outside for more than just a trip to the grocery store or a quick walk. I want to see you running around the park and looking at the sailboats down on the water. We thought last summer was fun...this one's going to kill last year! Lets try to convince daddy to rent a cottage this year, what do you say? YESSS. Anyway, my love, you are more and more perfect every day. Even when you're being a cheeky brat. Which is like a lot of times on most days. Still. Love you more than ever sweetest Ben. Thanks for being so cool and fun and adorable. Adriane and Billy (ok, ok, just Adriane) started this blog back in 2007 when they brought home their cheeky Golden Retriever pup. Since then they have documented their home projects, getting married, and having their sweet baby boys Benjamin and Sawyer. And the occasional dance party. Oh, and we have a shop! 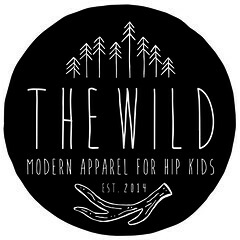 T H E W I L D is an independent brand of modern, minimalist clothing and accessories for babies and kids. Come say hello!